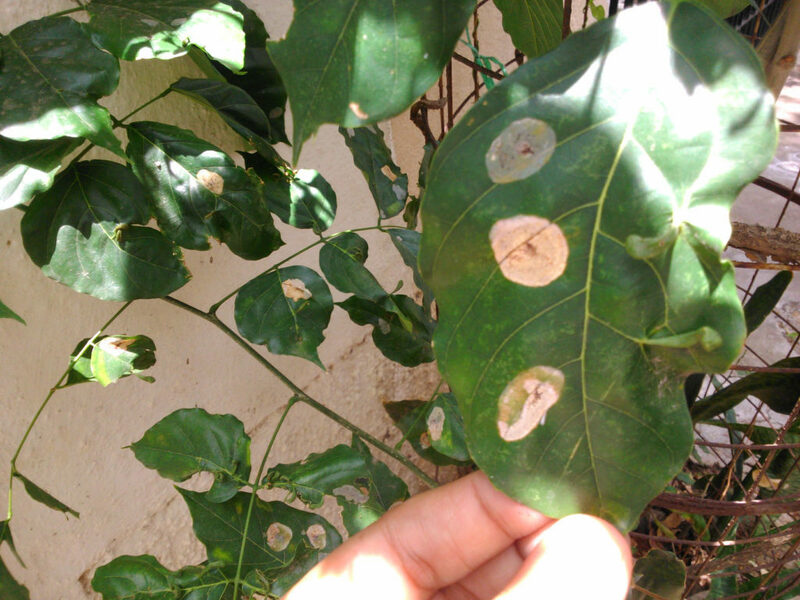 Many small organisms too seem to like Pongam trees. 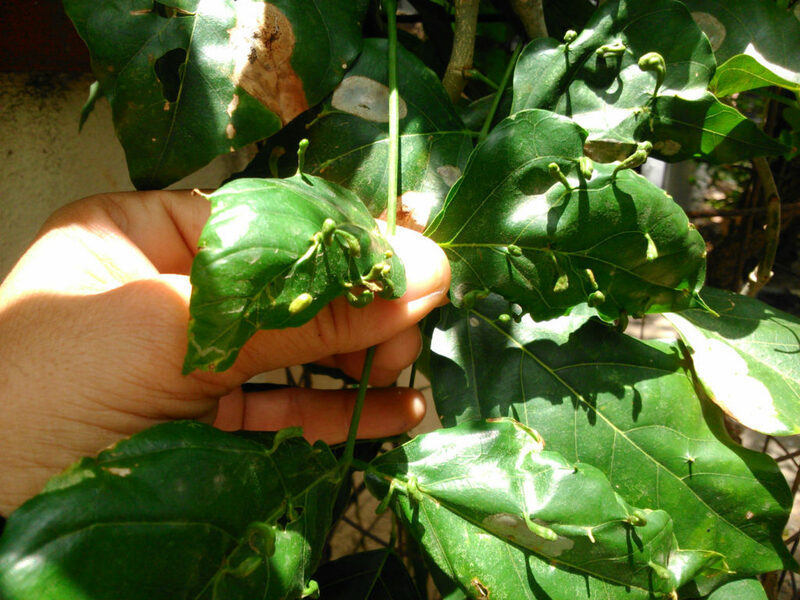 All the Pongam trees and saplings that we saw: in Kotivakkam and elsewhere in Chennai, and in Walajapet and Ranipet, had various markings on most of their leaves – light brown patches, green hook-like growths (galls) and snaky patches. Aneesa photographed them. The website of the Tamil Nadu Agricultural University mentioned different kinds of fungi and other pathogens which infest the Pongam tree. But were these fungi that we saw? We asked quite a few people; finally Anantanarayanan Raman, of Charles Sturt University, Orange, NSW, Australia, replied to our questions. He explained that, though he has not studied the arthropods associated with Pongamia, he has worked on the bioecology of arthropods infesting a few other plants of India and Australia. He told us that Pongamia, a native tree of the Indian subcontinent and occuring throughout India, is infested by various arthropods (insects and insect-like organisms) and microbes (fungi and bacteria); on the contrary many plants introduced from elsewhere usually harbour few arthropods and microbes – although things can change over time. 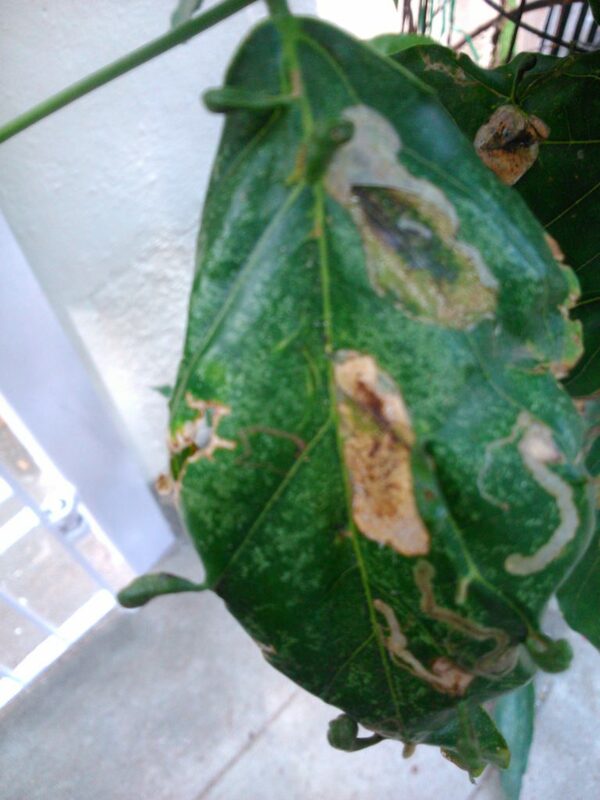 Raman has studied mango tree (Mangifera indica) infestations in India by 30-odd specialist gall midges that only attack mango trees, and by another set of 150 kinds of generalist insects. Interestingly the same mango genetic material (seeds and seedlings), which were taken to South Africa, Australia, Florida and the West Indies in the late 19th and early 20th Centuries, are hardly affected by any insects local to those regions. 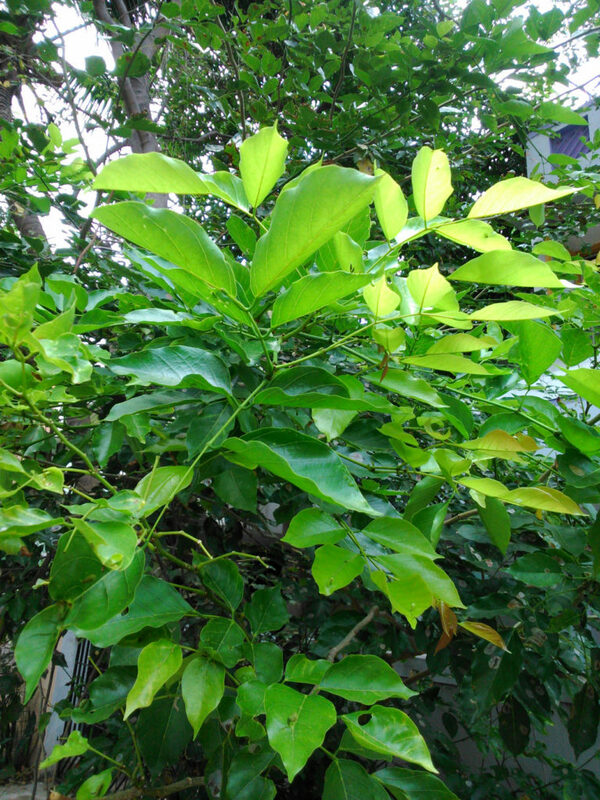 Arthropods that live on Pongam trees are tiny moths, flies, and mites. The tiny moths (Cameraria virgulata, a leaf-mining microlepidopteran belonging to the Gracillariidae), just a few millimetres long, lay eggs singly on leaves. Each emerging larva burrows under the epidermis of the leaf, chewing the upper leaf tissues with its mandibles: thus getting its food and making a ‘safe home’ for itself in the process. These ‘homes’ appear to us as translucent, round patches on the leaves. The dry translucent part is the ‘lifted epidermis’ of the leaf. The black powdery material is the feacal matter of the larva. 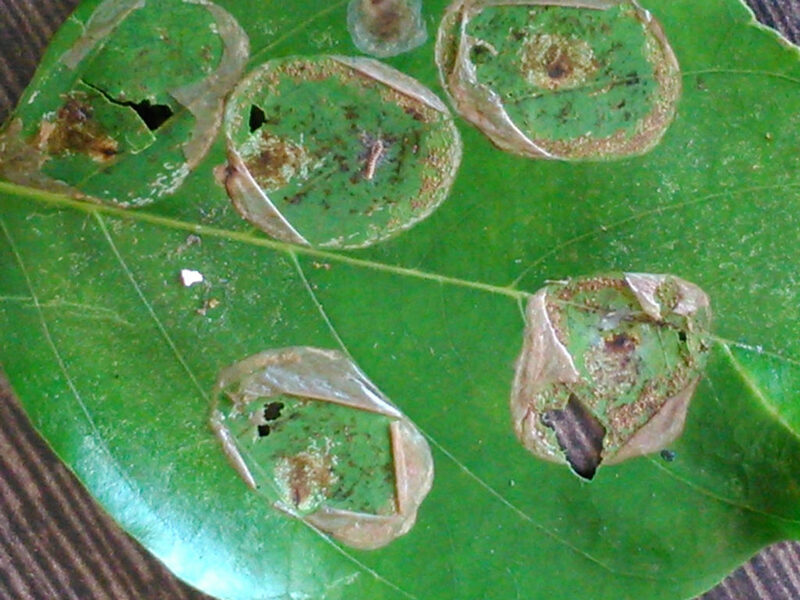 Slender serpentine mines on the Pongam leaves are made by the larvae of a tiny fly (Chromatomyia horticola, a leaf-mining dipteran (fly), belonging to the Agromyzidae). While the Gracillariidae induced mines are round, the Agromyzidae induced mines are snaky, and can be used in recognizing the insects whose larvae have made the mines. 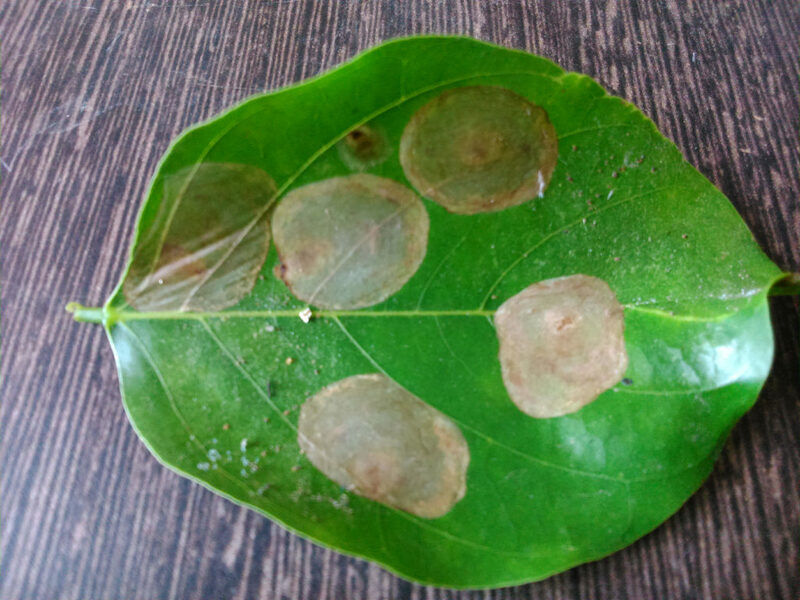 The galls on the leaves are induced by a mite (Aceria pongamiae, a plant-feeding Eriophyoidea (mite) belonging to the Eriophyidae)***. Remarkably these plant feeders do not kill the Pongam leaves. 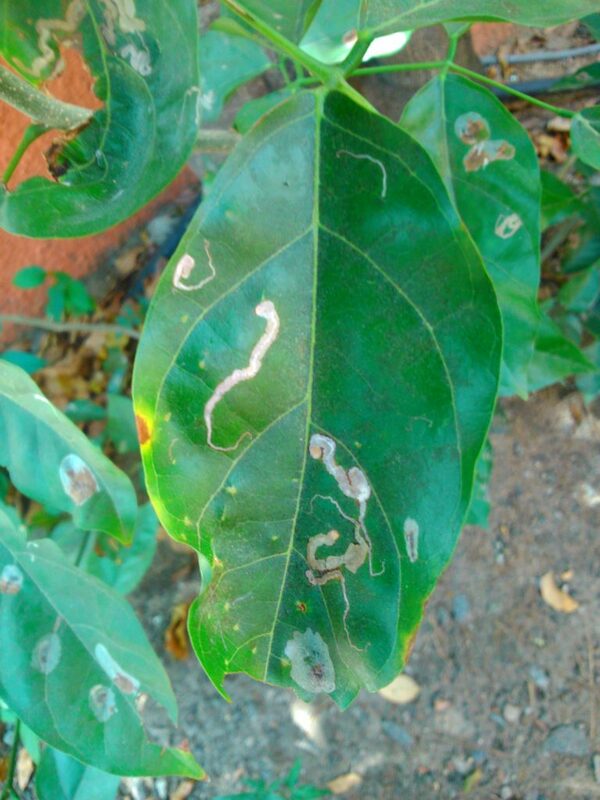 The leaf mining microlepidopteran larvae are really tiny and they eat only minute quantities of leaf tissues, which results in minimal damage to Pongam trees. Perhaps the trees too have evolved over time to ‘resist’ these organisms and, possibly the arthropod feeding produces no toxic compounds which could induce cell and organ death. Asking Raman helped us make some sense of our casual observations; but many questions remain with us, about those elusive little creatures and their relation with the trees. Our middle school students hope to investigate a few of these puzzles. *** Mites, like spiders, belong to the Class Arachnida – they have eight legs. The Small Science volumes are beautifully produced, the style is engaging and the drawings and graphics are very nice too (I loved the page border that ended with a spider at one end, and a pencil at the other! ): to my adult mind it looks as though the whole package will delight and interest a child!